Glug Glug Jugs were originally made by Thomas Forester & Son in Staffordshire in the late 1870’s. However, most people will associate these jugs with Dartmouth Pottery, who originally produced a fish shaped water jug which they called ‘Gurgling Fish Jugs…..a novelty which always attracts attention’. A special pair of jugs were made in 1958 for presentation to the Queen and Prince Philip on their visit to Britannia Naval College to present New Colours. The Commanding Officer of the college commissioned the jugs which were 9” tall, glazed green and embossed with the Royal insignia and the date 28th July 1958. This gift undoubtedly helped the popularity of the jugs, and they became great collector’s items. They were also used as advertising items by breweries, and over the years hundreds were made to advertise ‘Plymouth Gin’. Gurgling jugs were intended for use as water jugs – they inherited their name due to the sound they made when liquid was poured out. 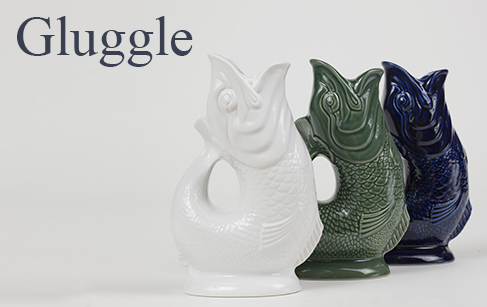 When Dartmouth Pottery closed in 2002, Wade Ceramics had the opportunity to buy the fish jug mould and have continued to produce the jugs since then. Up until now the jugs have mainly been exported to the US, however, Gluggle Ltd hopes to resurrect their popularity in the UK.